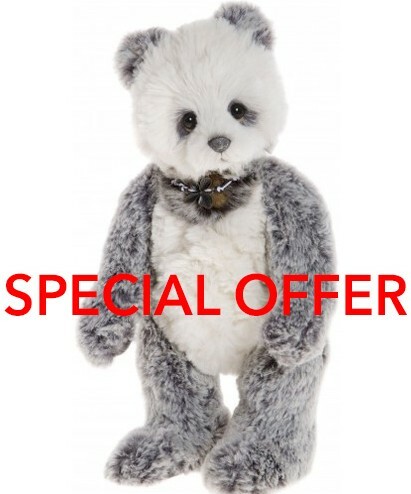 Ginny is a cute panda bear made with really soft grey and white plush fur. The arms, legs and ears have a lot of white tipping, adding to her wintery look. However, she won't be cold, as her fur is really thick and dense, so lovely to touch. She is only small, standing at 28cm (11") and is accessorised with a thread collar necklace with flower pendants. Her best friend is JAGO. Ginny is from the Charlie Bears 2017 Collection.